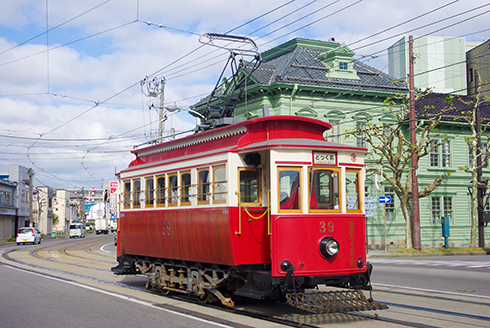 With a well-established network throughout the city, trams are the main transportation mode for sightseeing in Hakodate. Trams run every 6 to 12 minutes during the day and will take you to most of the main tourist spots, including Hakodate Station, Motomachi, the Bay Area, Goryokaku and Yunokawa. Fares cost between 210 to 250 yen, which is paid in cash when alighting. If you purchase a one-day tram pass, you can really take advantage of the trams with unlimited rides for the day. 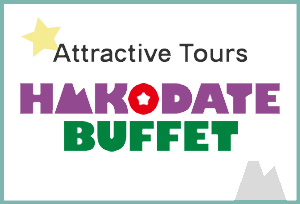 The passes are sold at the Tourist Information Center located inside Hakodate Station, and can also be purchased from hotel front desks, as well as directly from the driver. The passes cost 600 yen and come with a map of the line. Please scratch off the numbers with a coin indicating the year, month and date of the day you want to use the pass. 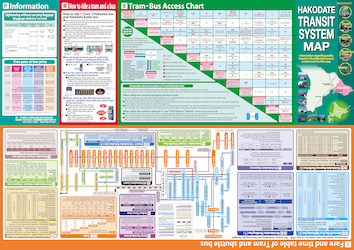 IC cards commonly used for transportation in Japan is valid for Hakodate Trams and Hakodate Buses. Suica and PASMO charged in Tokyo, Kitaca charged in Sapporo is usable for Hakodate Trams and Hakodate Buses. 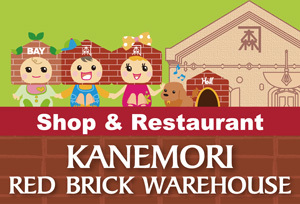 Conversely, Hakodate’s ICAS nimoca also is valid throughout Japan for your convenience. Buses are another convenient mode of transportation, offering direct access to the various tourist spots. 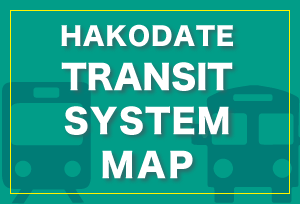 There is a bus information kiosk located in front of Hakodate Station where you can check on the best bus route for your destination, bus departure times, and bus fares. 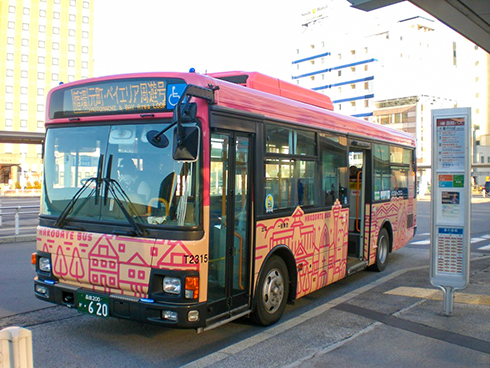 A shuttle bus departing from Hakodate Station will take you to Mt. 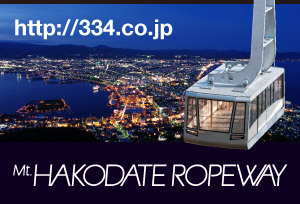 Hakodate Ropeway, the Goryokaku Tower, and the Trappistine Convent. The “Motomachi & Bay-area Shuyu-go” bus, which operates on a continuous loop between Hakodate Station and the Bay Area/Motomachi, is another convenient option. Hakodate Bus One-Day Pass "Kanpass"
One-Day Pass "Kanpass" is also valid on Mt. Hakodate Summit Bus, Goryokaku Tower / Trappistine Convent Shuttle Bus, Motomachi / Bay Area Shuyu-Go, and it costs 800 yen. 1 Day passes (1,000 yen) and 2 Day passes (1,700 yen) used for buses and trams are also available. 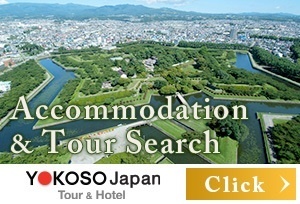 The shuttle bus service is highly recommended for easy access from Hakodate Airport to Yunokawa Onsen, Hakodate Station and the Bay Area. The service operates in accordance with flight schedules. Bus fares range from 230 to 420 yen. 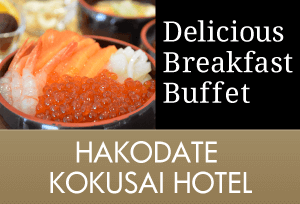 In addition, shuttle buses from Hakodate Ferry Terminal bound for Hakodate Station and from Shin-Hakodate-Hokuto Station (for the Shinkansen) bound for Goryokaku, Yunokawa and Hakodate Airport are also available. 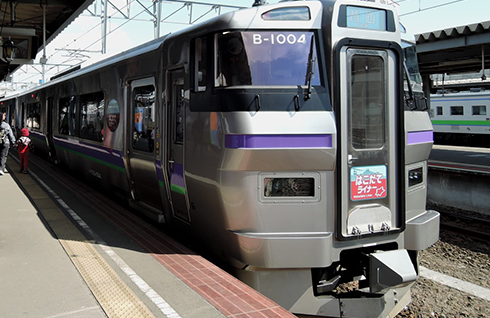 The final stop of the Shinkansen, “Shin-Hakodate-Hokuto” Station and Hakodate Station are connected shuttle train service “Hakodate Liner” that is approximately a 20-minute ride. It costs 360 yen for one-way. The shuttle is conveniently operated based on the schedule of the Shinkansen. Although there's a "Goryokaku" Station on the way, Goryokaku Park is far from the station. Please go all the way to Hakodate Station, and then use a tram or a shuttle bus. Donan Isaribi Railway (South Hokkaido Railway) is a local line that connects Hakodate Station and “Kikonai” Station, which is the next Shinkansen station, in 1 hour. There’s a scenic spot along the way where you can enjoy the ocean spread out right in front of you and it is popular. If you are lucky, you’ll be riding in colorfully painted special cars. Mt. 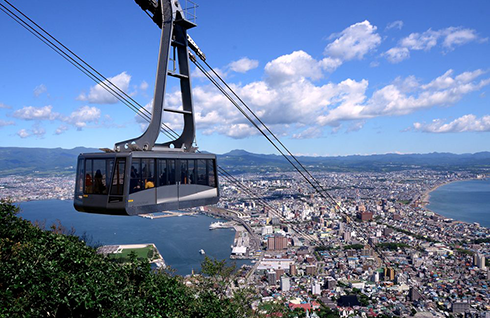 Hakodate Ropeway connects Sanroku (Mountain Base) and Sancho Tenbodai (Summit Observation Deck) in 3 minutes with large gondolas that accompany 125 people. 1,280 yen for round trip and 780 yen for one-way. Please note that in autumn the cable car operation is suspended for about 10 days due to a periodic inspection. Rental bicycles are a pleasant alternative for exploring Motomachi, the Bay Area, and the Goryokaku. “Hakorin” power-assisted bicycles are particularly recommended for traversing the Motomachi area. You won’t have any trouble climbing those formidable sloping streets with one of these bikes. The bicycles are only available when there is no snow on the ground (mid-April to early November). There are four rental locations around the city. Hakorin bicycles can be rented from Kiralis Hakodate in front of Hakodate Station, the Hakodate Community Design Center in Jujigai, or SHARE STAR HAKODATE(Shiesuta Hakodate) in Goryokaku. 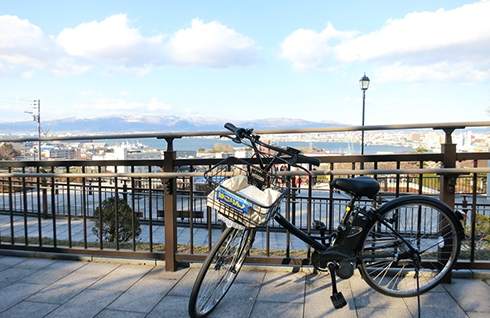 Regular bicycles can also be rented from BAY HAKODATE in the Bay Area. In addition, some hotels have their own bicycles for rent. Renting a car and taking a drive to the outskirts of Hakodate is a lovely way to experience Hakodate from spring through autumn. 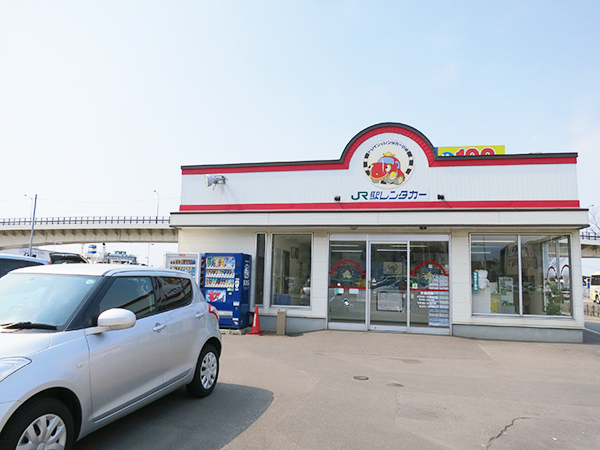 You’ll find dozens of rent-a-car kiosks at JR Hakodate Station and Hakodate Airport. 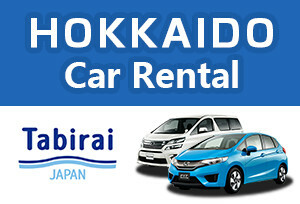 Prices start from 5,000 yen on a 6-hour basis for a standard 5-passenger car. 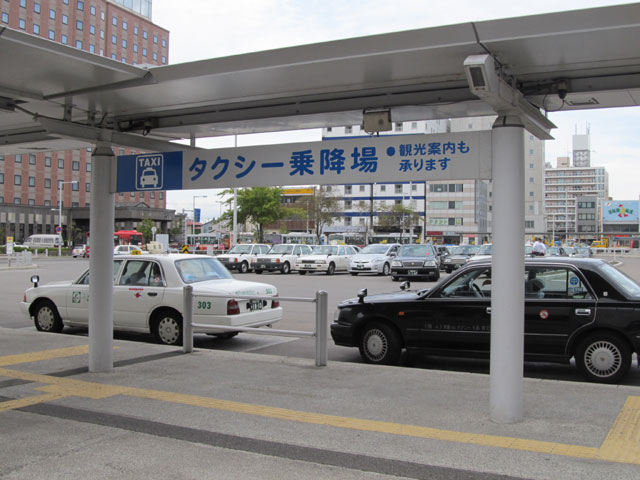 There is never a shortage of taxis outside Hakodate Station and Hakodate Airport, so you won’t have any trouble jumping into one when you need to. The base (minimum) fare when traveling within a range of 1.4 km is 550 yen for a small car and 570 yen for a medium-sized car. You can also charter a taxi for a set rate to take you around the tourist spots of your choice. You’ll be looking at around 16,000 yen to charter a small car for 3 hours. For basic information about transportation and tourist services available in Hakodate, download your own copy of the convenient one-stop “Guide to Hakodate” booklet! *The information here is current as of November 2016. Please check with each company before using their services.